Christopher J. Nassetta, President & Chief Executive Officer of Hilton, said, "We delivered solid third quarter results, as our resilient business model drove Adjusted EBITDA to the high end of guidance and diluted EPS, adjusted for special items, above expectations. Calendar shifts and weather impacts tempered reported RevPAR growth, but fundamentals remain strong. We continue to feel optimistic about overall demand trends for the balance of the year and into 2019. Additionally, we are excited to expand our global presence with the launch of Motto by Hilton, our new urban, lifestyle micro-hotel brand." For the three and nine months ended September 30, 2018, system-wide comparable RevPAR grew 2.0 percent and 3.3 percent, respectively, primarily driven by increased ADR. In particular, strength at Hilton's international hotels benefited results in both periods, particularly in the Europe and Asia Pacific regions. Management and franchise fee revenues increased 10 percent and 11 percent during the three and nine months ended September 30, 2018, respectively, as a result of RevPAR growth of 1.8 percent and 3.2 percent, respectively, at comparable managed and franchised hotels, increased license and other fees and the addition of new properties to Hilton's portfolio. For the three months ended September 30, 2018, diluted EPS was $0.54 and diluted EPS, adjusted for special items, was $0.77 compared to $0.49 and $0.56, respectively, for the three months ended September 30, 2017. Net income and Adjusted EBITDA were $164 million and $557 million, respectively, for the three months ended September 30, 2018 compared to $160 million and $511 million, respectively, for the three months ended September 30, 2017. For the nine months ended September 30, 2018, diluted EPS was $1.76 and diluted EPS, adjusted for special items, was $2.01 compared to $1.08 and $1.45, respectively, for the nine months ended September 30, 2017. Net income and Adjusted EBITDA were $544 million and $1,557 million, respectively, for the nine months ended September 30, 2018 compared to $359 million and $1,425 million, respectively, for the nine months ended September 30, 2017. In the third quarter of 2018, Hilton opened 113 new hotels totaling 16,100 rooms and achieved net unit growth of 14,800 rooms, which was a 24 percent increase from the same period in 2017. Conversions from non-Hilton brands represented more than 20 percent of the new rooms opened during the quarter. 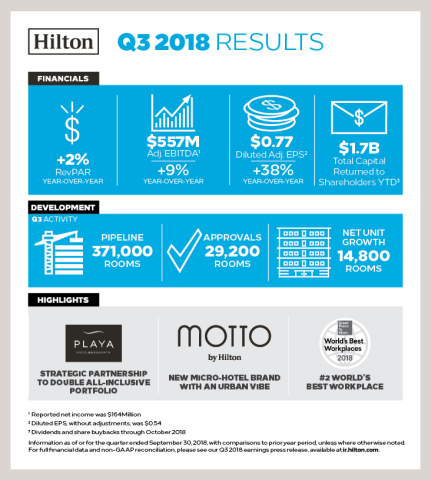 As of September 30, 2018, Hilton's development pipeline totaled nearly 2,420 hotels consisting of more than 371,000 rooms throughout 108 countries and territories, including 38 countries and territories where Hilton does not currently have any open hotels. Additionally, 202,000 rooms in the pipeline were located outside the U.S., and 196,000 rooms, or more than half, were under construction. During the quarter, Hilton added two notable properties to its luxury portfolio with the completed conversion of the Waldorf Astoria Las Vegas and the opening of the Waldorf Astoria Bangkok. In October 2018, Hilton launched its newest brand, Motto by Hilton, an urban-affordable, lifestyle product featuring efficiently designed, adaptable rooms and local food and beverage offerings. The first property is expected to open next year. As of September 30, 2018, Hilton had $7.7 billion of long-term debt outstanding, excluding deferred financing costs and discount, with a weighted average interest rate of 4.40 percent. Excluding capital lease obligations and other debt of Hilton's consolidated variable interest entities, Hilton had $7.4 billion of long-term debt outstanding, excluding deferred financing costs and discount, with a weighted average interest rate of 4.34 percent. Total cash and cash equivalents were $700 million as of September 30, 2018, including $79 million of restricted cash and cash equivalents. No borrowings were outstanding under the $1.0 billion revolving credit facility as of September 30, 2018. During the third quarter of 2018, Hilton repurchased over 1.5 million shares of its common stock at a cost of approximately $122 million and an average price per share of $78.81. To date, Hilton has repurchased approximately 35.3 million shares of its common stock for approximately $2.5 billion at an average price per share of $70.38; the amount remaining under Hilton's previously announced stock repurchase program is approximately $688 million. In September 2018, Hilton paid a quarterly cash dividend of $0.15 per share on shares of its common stock, for a total of $45 million, bringing year to date dividends to $137 million. In October 2018, Hilton's board of directors authorized a regular quarterly cash dividend of $0.15 per share of common stock to be paid on or before December 28, 2018 to holders of record of its common stock as of the close of business on November 9, 2018. The Company adopted ASU 2014-09 and ASU No. 2017-07 ("ASU 2017-07"), Compensation - Retirement Benefits (Topic 715): Improving the Presentation of Net Periodic Pension Cost and Net Periodic Postretirement Benefit Cost, on January 1, 2018 on a full retrospective basis in the condensed consolidated financial statements. Refer to Hilton's Quarterly Report on Form 10-Q for the quarter ended September 30, 2018, which is expected to be filed on or about the date of this press release, for the effect of the adoption on the Company's unaudited condensed consolidated financial statements for the three and nine months ended September 30, 2017. Share-based metrics in Hilton's outlook include actual share repurchases to date and do not include the effect of potential share repurchases. System-wide RevPAR is expected to increase between 3.0 percent and 3.5 percent on a comparable and currency neutral basis compared to 2017. Diluted EPS, before special items, is projected to be between $2.42 and $2.47. Diluted EPS, adjusted for special items, is projected to be between $2.67 and $2.72. Net income is projected to be between $743 million and $757 million. Adjusted EBITDA is projected to be between $2,075 million and $2,095 million, growing 9 percent to 10 percent from 2017, respectively. Cash available for capital return is projected to be between $1.8 billion and $1.9 billion. General and administrative expenses are projected to be between $420 million and $440 million. System-wide RevPAR is expected to increase between 2.0 percent and 3.0 percent on a comparable and currency neutral basis compared to the fourth quarter of 2017. Diluted EPS, before special items, is projected to be between $0.66 and $0.71. Diluted EPS, adjusted for special items, is projected to be between $0.66 and $0.71. Net income is projected to be between $199 million and $213 million. Adjusted EBITDA is projected to be between $518 million and $538 million. Management and franchise fee revenue is projected to increase between 9 percent and 11 percent compared to the fourth quarter of 2017. Hilton will host a conference call to discuss third quarter 2018 results on October 24, 2018 at 10:00 a.m. Eastern Time. Participants may listen to the live webcast by logging on to the Hilton Investor Relations website at http://ir.hilton.com/events-and-presentations. A replay and transcript of the webcast will be available within 24 hours after the live event at http://ir.hilton.com/financial-reporting/quarterly-results/2018. Alternatively, participants may listen to the live call by dialing 1-888-317-6003 in the United States or 1-412-317-6061 internationally. Please use the conference ID 1065924. Participants are encouraged to dial into the call or link to the webcast at least fifteen minutes prior to the scheduled start time. A telephone replay will be available for seven days following the call. To access the telephone replay, dial 1-877-344-7529 in the United States or 1-412-317-0088 internationally using the conference ID 10124398. This press release contains forward-looking statements within the meaning of Section 27A of the Securities Act of 1933, as amended, and Section 21E of the Securities Exchange Act of 1934, as amended. These statements include, but are not limited to, statements related to the expectations regarding the performance of Hilton's business, financial results, liquidity and capital resources and other non-historical statements, including the statements in the "Outlook" section of this press release. In some cases, these forward-looking statements can be identified by the use of words such as "outlook," "believes," "expects," "potential," "continues," "may," "will," "should," "could," "seeks," "projects," "predicts," "intends," "plans," "estimates," "anticipates" or the negative version of these words or other comparable words. Such forward-looking statements are subject to various risks and uncertainties, including, among others, risks inherent to the hospitality industry, macroeconomic factors beyond Hilton's control, competition for hotel guests and management and franchise contracts, risks related to doing business with third-party hotel owners, performance of Hilton's information technology systems, growth of reservation channels outside of Hilton's system, risks of doing business outside of the United States of America ("U.S.") and Hilton's indebtedness. Additional factors that could cause Hilton's results to differ materially from those described in the forward-looking statements can be found under the section entitled "Part I—Item 1A. Risk Factors" of Hilton's Annual Report on Form 10-K for the fiscal year ended December 31, 2017, filed with the Securities and Exchange Commission ("SEC"), as such factors may be updated from time to time in Hilton's periodic filings with the SEC, which are accessible on the SEC's website at www.sec.gov. Accordingly, there are or will be important factors that could cause actual outcomes or results to differ materially from those indicated in these statements. These factors should not be construed as exhaustive and should be read in conjunction with the other cautionary statements that are included in this press release and in Hilton's filings with the SEC. The Company undertakes no obligation to publicly update or review any forward-looking statement, whether as a result of new information, future developments or otherwise, except as required by law. The Company refers to certain financial measures that are not recognized under U.S. generally accepted accounting principles ("GAAP") in this press release, including: net income, adjusted for special items; diluted EPS, adjusted for special items; Adjusted EBITDA; Adjusted EBITDA margin; net debt; and net debt to Adjusted EBITDA ratio. See the schedules to this press release, including the "Definitions" section, for additional information and reconciliations of such non-GAAP financial measures. Hilton (NYSE: HLT) is a leading global hospitality company, with a portfolio of 15 world-class brands comprising more than 5,500 properties with nearly 895,000 rooms, in 109 countries and territories. Dedicated to fulfilling its mission to be the world's most hospitable company, Hilton earned a spot on the 2018 world's best workplaces list and has welcomed more than 3 billion guests during its nearly 100 year history. Through the award-winning guest loyalty program, Hilton Honors, nearly 82 million members who book directly with Hilton have access to instant benefits including digital check-in with room selection, Digital Key and Connected Room. Visit newsroom.hilton.com for more information, and connect with Hilton on facebook.com/hiltonnewsroom, twitter.com/hiltonnewsroom, linkedIn.com/company/hilton, instagram.com/hiltonnewsroom and youtube.com/hiltonnewsroom. (1) Includes owned and leased hotels, as well as hotels owned or leased by entities in which Hilton owns a noncontrolling interest. (1) Includes hotels owned or leased by entities in which Hilton owns a noncontrolling interest. Includes expenditures for hotels, corporate and other property and equipment, of which $4 million and $8 million were reimbursed by hotel owners for the three months ended September 30, 2018 and 2017, respectively, and $8 million and $13 million were reimbursed for the nine months ended September 30, 2018 and 2017, respectively. Includes $22 million and $13 million of expenditures that were reimbursed by hotel owners for the three months ended September 30, 2018 and 2017, respectively, and $47 million and $28 million for the nine months ended September 30, 2018 and 2017, respectively. Fluctuation in terms of percentage change is not meaningful. Includes expenses related to the January 2017 spin-offs of Park Hotels & Resorts Inc. and Hilton Grand Vacations Inc. (the "spin-offs") that were recognized in general and administrative expenses. Includes expenses incurred in connection with the April 2018 and March 2017 refinancings of the senior secured term loan facility that were recognized in other non-operating income, net. Includes adjustments to the provisional amount recognized in relation to the Tax Cuts and Jobs Act enacted in December 2017, as well as deferred tax expense recognized in connection with a distribution of stock out of one of Hilton's controlled foreign corporations, none of which had an effect on cash paid for taxes in the period. Includes a gain on the early repayment of a loan we issued that financed the construction of a hotel that Hilton manages and, for the nine months ended September 30, 2018, also includes a gain on the refinancing of that loan. (1) Includes adjustments for severance and other items and, for the three and nine months ended September 30, 2017, also includes transaction costs. Trailing twelve months ("TTM") September 30, 2018 is calculated as the nine months ended September 30, 2018 plus the year ended December 31, 2017 less the nine months ended September 30, 2017. Includes adjustments for severance and other items and, for the nine months ended September 30, 2017 and year ended December 31, 2017, also includes transaction costs. See "—Net Income and Diluted EPS, Adjusted for Special Items" for details of these special items. (1) Includes adjustments for severance and other items. This press release includes certain unaudited financial information for the TTM period ended September 30, 2018, which is calculated as the nine months ended September 30, 2018 plus the year ended December 31, 2017 less the nine months ended September 30, 2017. This presentation is not in accordance with GAAP. However, the Company believes that this presentation provides useful information to investors regarding its recent financial performance, and it views this presentation of the four most recently completed fiscal quarters as a key measurement period for investors to assess its historical results. In addition, the Company’s management uses TTM information to evaluate the Company’s financial performance for ongoing planning purposes. Net income, adjusted for special items, and EPS, adjusted for special items, are not recognized terms under GAAP and should not be considered as alternatives to net income (loss) or other measures of financial performance or liquidity derived in accordance with GAAP. In addition, the Company's definition of net income, adjusted for special items, and EPS, adjusted for special items, may not be comparable to similarly titled measures of other companies. Net income, adjusted for special items, and EPS, adjusted for special items, are included to assist investors in performing meaningful comparisons of past, present and future operating results and as a means of highlighting the results of the Company's ongoing operations. Earnings before interest expense, taxes and depreciation and amortization ("EBITDA"), presented herein, reflects net income (loss), excluding interest expense, a provision for income taxes and depreciation and amortization. Adjusted EBITDA, presented herein, is calculated as EBITDA, as previously defined, further adjusted to exclude certain items, including gains, losses, revenues and expenses in connection with: (i) asset dispositions for both consolidated and unconsolidated investments; (ii) foreign currency transactions; (iii) debt restructurings and retirements; (iv) furniture, fixtures and equipment ("FF&E") replacement reserves required under certain lease agreements; (v) reorganization costs; (vi) share-based compensation expense; (vii) non-cash impairment losses; (viii) severance, relocation and other expenses; (ix) amortization of contract acquisition costs; (x) the net effect of reimbursable costs included in other revenues and expenses from managed and franchised properties; and (xi) other items. During the first quarter of 2018, the Company modified the definition of Adjusted EBITDA to exclude the amortization of contract acquisition costs and the net effect of reimbursable costs included in other revenues and expenses from managed and franchised properties. Management believes that excluding these items is useful for the reasons set forth below and has applied the modified definition of Adjusted EBITDA to all periods for which Adjusted EBITDA is presented in this release. Adjusted EBITDA margin represents Adjusted EBITDA as a percentage of total revenues, as adjusted to exclude the amortization of contract acquisition costs and other revenues from managed and franchised properties. The Company believes that EBITDA, Adjusted EBITDA and Adjusted EBITDA margin provide useful information to investors about the Company and its financial condition and results of operations for the following reasons: (i) these measures are among the measures used by the Company's management team to evaluate its operating performance and make day-to-day operating decisions; and (ii) these measures are frequently used by securities analysts, investors and other interested parties as a common performance measure to compare results or estimate valuations across companies in the industry. Additionally, these measures exclude certain items that can vary widely across different industries and among competitors within the Company's industry. For instance, interest expense and the provision for income taxes are dependent on company specifics, including, among other things, capital structure and operating jurisdictions, respectively, and, therefore could vary significantly across companies. Depreciation and amortization, as well as amortization of contract acquisition costs, are dependent upon company policies, including the method of acquiring and depreciating assets and the useful lives that are used. For Adjusted EBITDA, the Company also excludes items such as: (i) FF&E replacement reserves to be consistent with the treatment of FF&E for its owned and leased hotels where it is capitalized and depreciated over the life of the FF&E; (ii) share-based compensation expense, as this could vary widely among companies due to the different plans in place and the usage of them; (iii) the net effect of the Company's cost reimbursement revenues and reimbursed expenses, as the Company contractually does not operate the related programs to generate a profit over the terms of the respective agreements; and (iv) other items that are not core to the Company's operations and are not reflective of the Company's performance. EBITDA, Adjusted EBITDA and Adjusted EBITDA margin are not recognized terms under GAAP and should not be considered as alternatives, in isolation or as a substitute, to net income (loss) or other measures of financial performance or liquidity derived in accordance with GAAP. The Company's definitions of EBITDA, Adjusted EBITDA and Adjusted EBITDA margin may not be comparable to similarly titled measures of other companies and may have limitations as analytical tools. Net debt, presented herein, is a non-GAAP financial measure that the Company uses to evaluate its financial leverage. Net debt is calculated as: (i) long-term debt, including current maturities and excluding unamortized deferred financing costs and discount; and (ii) the Company's share of unconsolidated affiliate debt, excluding unamortized deferred financing costs; reduced by: (a) cash and cash equivalents; and (b) restricted cash and cash equivalents. Net debt should not be considered as a substitute to debt presented in accordance with GAAP. Net debt may not be comparable to a similarly titled measure of other companies. The Company defines comparable hotels as those that: (i) were active and operating in the Company's system for at least one full calendar year as of the end of the current period, and open January 1st of the previous year; (ii) have not undergone a change in brand or ownership type during the current or comparable periods reported, excluding the hotels distributed in the spin-offs; and (iii) have not sustained substantial property damage, business interruption, undergone large-scale capital projects or for which comparable results are not available. Of the 5,509 hotels in the Company's system as of September 30, 2018, 4,257 hotels were classified as comparable hotels. The 1,252 non-comparable hotels included 203 hotels, or approximately four percent of the total hotels in the system, that were removed from the comparable group during the last twelve months because they sustained substantial property damage, business interruption, underwent large-scale capital projects or comparable results were not available. Occupancy represents the total number of room nights sold divided by the total number of room nights available at a hotel or group of hotels for a given period. Occupancy measures the utilization of the hotels' available capacity. Management uses occupancy to gauge demand at a specific hotel or group of hotels in a given period. Occupancy levels also help management determine achievable average daily rate pricing levels as demand for hotel rooms increases or decreases. RevPAR is calculated by dividing hotel room revenue by total number of room nights available to guests for a given period. Management considers RevPAR to be a meaningful indicator of the Company's performance as it provides a metric correlated to two primary and key drivers of operations at a hotel or group of hotels: occupancy and ADR. RevPAR is also a useful indicator in measuring performance over comparable periods for comparable hotels. References to RevPAR, ADR and occupancy throughout this press release are presented on a comparable basis and references to RevPAR and ADR are presented on a currency neutral basis, unless otherwise noted. As such, comparisons of these hotel operating statistics for the three and nine months ended September 30, 2018 and 2017 use the exchange rates for the three and nine months ended September 30, 2018.